Is Corbyn the Future of the Left? Jeremy Corbyn’s ascent has given hope to the global Left. But the Corbyn model’s success will hinge on how it copes with roiling conflicts over national identity. Politics is in a plastic period. And so is the Left. In Britain, what once seemed unthinkable has happened. The Labour left have steadily taken control of their party. The whole history of the Labour Party seems to militate against this, as even sympathizers, like the late Ralph Miliband, have long pointed out. And after two decades in which the apostles of Tony Blair’s New Labour had exercised tight control and sought to remold the party in their own image, the prospects for the Labour left seemed less propitious than ever. And yet, their candidate, Jeremy Corbyn, first won the Labour leadership in 2015, saw off a unprecedented leadership challenge from his own MPs in 2016, and followed that by significantly increasing Labour share of the vote from 30 percent to 40 percent in the snap general election of 2017, leaving the governing Conservative Party without a majority in its own right. His supporters now control Labour’s National Executive. Is this simply a singular development — a British one-off? Or is it part of a more general shift in politics that we might also expect to see elsewhere? Let me start by comparing the British case with the United States. I’ll then turn to other English-speaking countries, before finally comparing the British case with the most recent developments in the established democracies of continental Europe. Prima facie, the United States seems to have experienced similar developments, with the rise of Bernie Sanders. Like Corbyn, Sanders was an insurgent candidate from outside the party establishment, with a long record of dissident integrity, and the reputation for authenticity which that fostered. And like Corbyn, he held views that were seen as well to the left of either the median voter or parliamentarian, and had until recently been thought of as a marginal figure in the political firmament. Indeed if anything, all of this was more true of Sanders than of Corbyn. In Britain, a notionally socialist party had long been a contender for government. In the United States, socialism was widely seen in both scholarly studies and public debate as beyond the bounds of mainstream politics. And the idea that a candidate might get anywhere near national office while embracing the label of socialism has seemed well-nigh inconceivable for over a century. The best result socialist activists could point to was Eugene Debs’s 6 percent in 1912. And yet here was Sanders: a figure who came close to becoming a major party presidential candidate and who, opinion polls showed, had he become the candidate, may well have won the presidential election itself. Indeed without the partial Americanization of the British Labour Party’s leadership election Corbyn would never have become leader. Influenced in part by the model of the US primary system, his predecessor, Ed Miliband, had abolished an electoral college in which parliamentarians, union affiliates, and rank-and-file members each had a third of the vote, and replaced it with a system of one vote for each member or supporter. Anyone who paid £3 (later increased to £25) could sign up as a supporter, and well over a hundred thousand did. Paradoxically, this reform was urged by Tony Blair and his supporters. In the wake of an alleged instance of union malpractice in the selection of a candidate in one particular constituency — an infraction for which the union was subsequently cleared — Ed Miliband, whose own leadership was constantly being destabilized by some of Blair’s supporters, felt he had to show he was being tough on the unions. So consumed was Blair with antipathy towards the unions — organizations which for more than a century had regularly underwritten the control of the Labour right — that he promoted a reform that was bound to produce a more radical intraparty electorate by increasing the pool of activist electors and strengthening the influence of their votes. But it would be a mistake to overstate the similarities between Britain and the United States. In most respects, British party politics remained fundamentally different. The Labour Party is not merely a label (or a brand) which enables supporters to engage in candidate selection, but an ongoing membership organization for which the unions that founded it continue to provide vital ballast. And the parliamentary nature of the political system in which it operates leaves Corbyn in a far stronger position than a defeated candidate in the United States, by giving him a clear, ongoing, constitutionally recognized role as leader of the opposition (the Prime Minister in waiting) at the head of a government in waiting (the Shadow Cabinet). Moreover, at present this influence is further accentuated, both within the Labour Party and in parliament: within the party because Labour’s unexpectedly strong electoral performance in 2017 has stabilized Corbyn’s position among previously hostile MPs; and within parliament because the election has left the governing Conservative Party, even after reaching an agreement with the small Northern Ireland Unionist Party of the late Ian Paisley, with an extremely narrow parliamentary majority. Of course Sanders did not win his party’s nomination, but these different institutional characteristics go some way to explaining why, with the elections over, Corbyn has been able to play a far more influential role than Sanders would have, even if he had been the defeated nominee. How does the British experience look if we compare it with a broader range of countries? The parallels between Trump and Brexit, as well as Sanders and Corbyn, have led many to conclude that these phenomena are part of a general trend, which many countries are experiencing, and that developments in the US and UK are paradigmatic of developments elsewhere. But even if we limit ourselves to the English-speaking world, it’s not clear that British and American developments can be treated as paradigmatic. There are right-wing challenges from anti-immigrant populists in other English-speaking countries, but they are more contained. In Canada the mainstream Liberals won government in part by positioning themselves to the left of the social-democratic NDP in some areas of economic policy and Prime Minister Trudeau had himself filmed welcoming Syrian refugees at the airport. In Australia, Labor has a good chance of returning to government after more than two years of opinion-poll leads, and the anti-immigrant One Nation party of Pauline Hanson experienced only a limited surge in the 2016 federal elections, winning about 4 percent of the vote for the Senate and about 1 percent for the House of Representatives. And in New Zealand, Labour won 37 percent of the vote in 2017 and is now in power, albeit in a coalition, as might be expected given the country’s proportional-representation electoral system. There are some similarities in all the English-speaking countries. But they are not a function of Trump and Brexit or Sanders and Corbyn. In each case there has been some shift to the left in political demands — with greater emphasis on economic inequality and corporate malfeasance. In Australia, for example, the trade union movement — which there, too, forms the bedrock of the Labor Party — has launched a huge public advertising campaign arguing that “big business has too much power” and that “it’s time to change the rules.” And, in each case, the long-standing electoral parties of government on the Left are either in power or in reach of power and remain the focal point for the electoral efforts of progressives. But in most cases, their leaders do not hail from the dissenting left. If we move outside the English-speaking world and turn to the established democracies of continental Europe, the differences with Britain are starker. Consider the national elections in Western Europe since the beginning of 2017. Everywhere there has been a sharp rise in the challenge of right-wing, anti-immigrant, populist parties, including those that are the direct descendants of European fascist organizations. And while the fate of the established electoral parties of the Left has varied, all have seen very poor electoral results. Moreover, recent elections have shown little evidence that losses for the conventional left might be compensated for by gains for radical insurgent parties on the model of Podemos or Syriza. In France and Italy, where Communist parties were once the dominant parties of the Left, there have been sharp drops in the vote for the Left — offset only partially by support for new radical challenger parties on the Left. The French election was especially dramatic. The Socialist Party’s first-round vote collapsed from 29 percent in the previous presidential election to 6 percent, with Jean-Luc Mélenchon to their left increasing his vote from 11 percent to 19 percent. But in Italy, too, the Democratic Party vote fell from 25 percent at the last parliamentary election to 18 percent, with the new Free and Equal party to its left adding only another 3 percent. In Austria, Germany, and the Netherlands, where social democracy was always dominant, the outcomes have varied from maintaining a historically low 27 percent in Austria, to reaching a new historic low of 20 percent in Germany, to the potentially existential decline of the Dutch Labour Party from 25 percent to just 6 percent. Only in Britain has the main electoral party of the Left actually increased its share of the vote. What might account for the different outcomes in Britain and the rest of Europe? Different electoral systems no doubt play a role. In the English-speaking countries, all except New Zealand use majoritarian systems. In the recent continental European elections, all except France use proportional representation. The simple majority (first past the post) system in Britain certainly weakens the incentive for discontented Blairite MPs to break away and form a separate party. That approach was tried in the 1980s and its failure is widely understood. But beyond this, in all of these countries, the global financial crisis that began in 2008 has generated a massive exogenous shock — one with the potential to realign the social bases of party support. And we know from the Great Depression of the 1930s that realignment often lags the first impact of the shock by many years. In the United States, for example, the realignment took place not in 1929 or in 1932, but after the 1936 elections. It’s easy to forget that in the election of 1932, Franklin Delano Roosevelt ran, in some respects, on an orthodox fiscal platform, calling for a balanced budget. One thing that the poorly performing parties of the Left in recent continental European elections have in common is rejection following a period of responsibility for managing the aftermath of this crisis: either alone (as in France and Italy) or in coalition with others (in Austria, Germany, and the Netherlands). Responsibility during the onset of the crisis affected British Labour too in the elections of 2010 and 2015. One of the more extraordinary and demoralizing features of British politics was the ease with which David Cameron’s Conservative Party was able to shift the blame for the deficit from bankers — whose responsibility must surely have been apparent to even those with minimal interest in current affairs — to alleged Labour Party profligacy and the dissoluteness of the unemployed. But after seven years in power, Tory efforts to shift responsibility for the results of their austerity policies onto their Labour predecessors were becoming harder to sustain. And perhaps more important still, Corbyn and his closest colleagues were so clearly themselves in opposition to the Labour governments of Blair and Brown that any attempt to link them to the putative responsibility of those governments lacked plausibility. But following the 2016 referendum to leave the European Union, Britain is now experiencing a second enormous shock with the potential to induce realignment. The passions aroused by Brexit are both an opportunity and a dilemma for Labour. And the process of extricating itself from the European Union is likely to remain the dominant political issue for at least three more years, and possibly much longer. There is an opportunity because, with the Tories embracing a full-blown Brexit, a certain number of “Remain” voters who would not normally vote for Labour have now been prepared to do so because of the importance they attach to resisting a hard Brexit. This can be seen in Labour’s unprecedented success in some very wealthy but pro-EU London seats. And it’s born out more generally by the Conservatives’ loss of votes in seats that voted strongly to remain. But there is also a dilemma for Labour — a dilemma reflected in Corbyn’s tendency to adopt a strategy of ambiguity which refuses to commit Labour to a clear stance on Brexit. 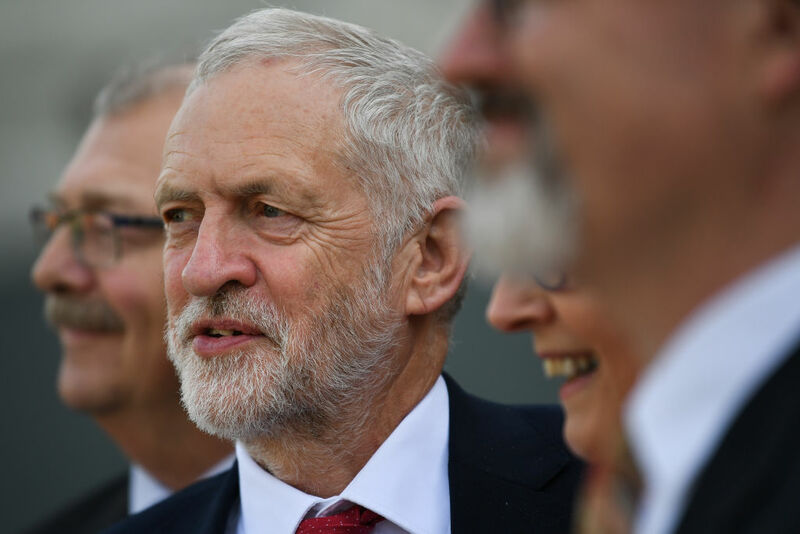 On economic policy and questions of social justice, Corbyn has attempted to be a preference shaper, making a sharp break from the center-seeking leadership strategy of Tony Blair, who was always chasing the median voter. But on Brexit, his mode of leadership is completely different. Here he has tried to downplay the salience of the issue, hedge his bets, and treat it as if it’s a secondary problem. While Corbyn has led from the front in challenging austerity, on Brexit he has been far more quiescent. Partly this is a product of his personal history and preferences. Though formally in favor of remaining in the EU during the referendum, Corbyn was long a proponent of the left-wing argument for leaving the EU associated with Tony Benn and others. It is easy to forget that, until the 1980s, Euroskepticism was a powerful current in the Labour party. This left-wing argument for Brexit focuses on the EU attempt to institutionalize various forms of economic liberalization and hence sees it as being inimical to socialist interventions in economic life. However, neither the meaning of Brexit for its supporters nor the institutions that are likely to be built in its wake currently offer much hope for the proponents of this argument. In the referendum itself, it was not the anticapitalist left but the anti-immigrant right which was most closely associated with the argument for Brexit, and their arguments were a far more important driver for Leave voters. And in the wake of the result, the fear that once outside the EU the Conservatives may use the opportunity to build a still more buccaneering, Singapore-style capitalism in Britain has tended to overshadow notions of any theoretical socialist potential. In addition, Corbyn has an incentive to play down his Euroskepticism, since his own leadership has been built on a huge insurgency of activists, many of them younger voters, who are overwhelmingly hostile to leaving the EU. Membership of the Labour Party has almost tripled since Corbyn first ran for leader, to about 550,000. By contrast, the next biggest party, the ruling Conservatives, probably has less than 100,000 members. These Labour Party members are the people who elected and then reelected him to the leadership, in the face of an unprecedented revolt against him by Labour MPs. But they are also among the most intensely hostile to both Brexit itself and the anti-immigrant politics with which it is enmeshed. But in truth, anyone who was leader of the Labour Party — whatever their personal attitude to the EU — would face a difficult dilemma. On the one hand, over two-thirds of Labour voters voted to remain in the EU, and Labour’s MPs and activists were both overwhelmingly for remaining, and are now overwhelmingly in favor of ensuring a “soft” Brexit that keeps Britain as close to the EU as possible. On the other hand, close to one-third of Labour voters, including many traditional Labour voters in the north of England, want to leave. And some two-thirds of Labour MPs represent seats in which a majority of voters opted to leave. The potential for Brexit to have long-term partisan consequences is readily apparent if you consider the development of the party system in early twentieth-century Ireland. Divisions over independent Ireland’s constitutional settlement and its future relationship with Britain were so powerful in structuring the party system that the two parties that emerged from this cleavage remain the two main parties in Ireland to this day. Fianna Fáil was the party of hard “Irexit” — not from the EU, of course, but from the UK — while Fine Gael was the party of soft “Irexit.” The dominance of this conflict left class a second-order cleavage in the party system, and left Labour a much smaller third party. The unique nature of British Labour’s Brexit dilemma makes it difficult to draw straightforward lessons for other countries. Nevertheless, the Brexit dilemma may well be a special case of a more general dilemma confronting major electoral parties of the Left across the established capitalist democracies. In all of these, a class cleavage is not just of enduring historical significance but has been reinvigorated in the wake of the global financial crisis. But a crosscutting cultural cleavage focused on identity and belonging has also grown in significance — one which looks something like the cleavage between so-called “materialists” and “post-materialists” that Ronald Inglehart and his colleagues have been tracking since the 1970s. Both the class and the values cleavage define a “left” and each has a core constituency. At the core of the first is the traditional — and still large — working-class constituency. At the core of the second is a progressive group of the middle class. How to bridge the interests of these groups and sustain a coalition between them is arguably the central dilemma facing democratic socialists in the established capitalist democracies. Robin Archer is the Director of the Ralph Miliband Program at the London School of Economics, where he also directs the postgraduate program in political sociology. He is the author of Economic Democracy: The Politics of Feasible Socialism (Oxford, 1998) and Why Is There No Labor Party in the United States? (Princeton, 2010). Where Is Our Labor Party?